Fresh research has confirmed that cycle commuting remains a disproportionately young, male activity. While the bike trade has made big strides in redressing previous imbalances, thanks in part to a rise in the number of women working within it, and the likes of British Cycling are actively aiming to grow the number of women in cycling, a quick head count at your average bike show will surprise no one if it revealed more men than women. Cycling’s gender imbalance has even resulted in bike infrastructure investment coming under fire from an MP claiming two-wheeled travel was largely the domain of "young, white men". 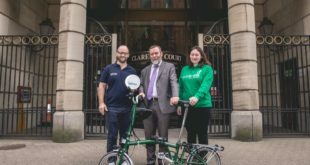 Some light has been thrown on this issue from new research based on Census data in 2001 and 2011, indicating that growing cycling levels have not been accompanied by greater age and gender diversity (at least up until 2011). In places where cycling to work has risen over the decade, cycle commuting has remained a disproportionately male activity, further skewed to younger age groups. Interestingly, the project found that places where cycling levels are higher have higher proportions of female and older cyclists. For example, Cambride has the UK’s highest cycling levels, with almost equal proportions of men and women cycling to work. The research has been funded by the Economic and Social Research Council (ESRC), and part of a project led by the Centre for Diet and Activity Research (CEDAR) and the National Institute for Health Research (NIHR). The researchers looked at the relationship between cycling levels and gender balance in all English and Welsh local authorities, using the Census data. In both years there was a clear relationship: areas where cycling levels were higher, such as Cambridge, had a greater proportion of female cyclists. By contrast in areas with very low cycling levels, the gender ratio was extremely unequal, with men up to 14 times more likely to cycle to work than women. The researchers then looked at representation of older adults (aged 55-74) among commuting cyclists. In 2001, authorities with higher cycling levels tended to have more equal representation of older people among cycle commuters, although in 2011 the relationship was less clear. Given these cross-sectional results, the authors had expected to find that where cycling has risen, the mix of people cycling would become more equal in terms of age and gender. However, when looking at local authority areas where cycling has gone up, they found this wasn’t the case. Although more women are cycling in those areas, the gender balance isn’t becoming any more equal – cycling is still disproportionately attracting men. The under-representation of older people among cyclists actually increased. The researchers pointed to Inner London as one of cycling’s success stories, seeing a rise in cycle commuting from 3.8% to 7.2% of workers from 2001 to 2011. However, gender disparities remain, with men continuing to be around 50% more likely to cycle to work than women. And the proportion of older cyclists among Inner London commuters fell from one in seven to around one in ten. The paper’s lead author Dr Aldred, at the University of Westminster, said: “We know from the Netherlands and Denmark that women and older people will cycle, if the conditions are right. But these results show that UK policy-makers cannot assume that if cycling grows it will inevitably become more diverse. This has not happened and so we should be targeting policy towards currently under-represented groups.